Higher tension than the standard strings so perfect when drop tuning. 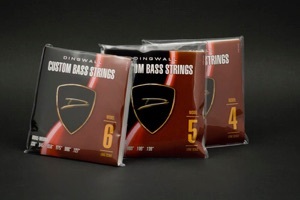 New Dingwall Nickel strings - after two years of extensive R&D we are proud to announce the new Dingwall Nickel strings - added warmth and a smoother feel. 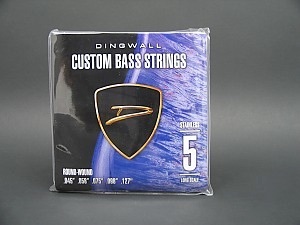 Dingwall Stainless steel strings are a high grade stainless steel custom gauge set designed specifically for the Fan Fret basses guitars. As the innovators of today’s best-selling electric bass strings like Deep Talkin’ Bass Flat Wounds, Black Nylon Tape Wounds and the 0760M Original “1954” set, La Bella Strings is proud to introduce the latest achievement in bass strings: the Rx Series. Representing the culmination of months of R&D alongside La Bella Strings’ Inner Circle of Artists, the Rx Series has received acclaim from the best bass players in the world across all styles and genres of music. The Rx Series is available in both Stainless Steel & Nickel-Plated Steel, in 4, 5, and 6-String models. Each set is available in 4 different gauges (Model A, B, C, and D) for a total of 24 new sets, which means each and every player is bound to find the perfect set for his or her bass! TONE. BRIGHTER than typical coated strings AND non-treated strings. FEEL. The Ionic Vapor Process™ improves the string’s surface properties, resulting in SMOOTHER strings vs. both typical coated and non-treated strings. 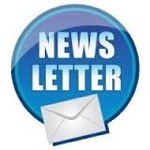 ENDURANCE: No flaking after extended play. Impervious to grime, tarnishing and oil residue. Thomastik Infeld, producers of the legendary Spirocore strings for the Double Bass, bring their unrivalled experience and quality to the Bass Guitar. First up the Jazz Series strings. Available in Roundwound and Flatwound these strings use a highly pliable steel core wrapped in a silk inlay, both have a nickel alloy winding. The flatwound have a true ribbon winding resulting in an incredible depth of tone. The roundwound bass strings have small diameter round winding giving more bite while minimising string "squeak" and wear on the frets. Jazz series Bass Strings are lower tensioned and gauged to ease playability and strain on the instrument. Smooth, Warm, Balanced the E-Bass Jazz Series are strings with extended durability and high output. A highly flexible steel core gives the string a balanced feeling and a special character. The overall sound characteristics can be described as very close to the double bass. These strings were designed to sound good with your tone control as wide open as possible taking advantage of the pu's wide sonic range. The Stainless steel strings give maximum clarity on the high end and upper mids helping "cut" through the mix but also have excellent bass response. The Nickel string have greater lower mid and low end with smooth yet clear high end, the greater tension allows you to use a straighter neck and lower action. A .130T-H (Medium Heavy) B string will be available for those who tune down or want an even more authoritative B. The .35 is for 6 shooters. NEW! Reduced Core (RC) Payson Fanned NS set. This model has the same relatively larger exact outer winding as the original PFNS sets, but with a reduced core on the .105E, .85A, .65D and .45G. This results in lighter tension and greater harmonics with the same smooth outer feel. D'Addario Half Round bass strings are wound with pure nickel, then precision ground, leaving the outer surface smooth and "semi-flat," while retaining the flexibility of round wound strings. They retain round wound brightness and sustain thanks to our exclusive "heat treating" process. As promised here is some feedback on my experiences with the Dingwall P-Tone pickup that you recently supplied for my Dingwall AB1 5. As you said, fitting is a doddle and as I was removing the strings to fit the new pickup, I also chose to fit a set of Payson nickels instead of replacing with Dingwall Voodoos. So my new experience was with the heavier nickel strings as well as the Dingwall P-Tone pickup. 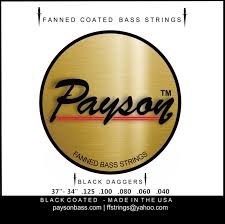 Firstly the Payson strings; as I am quite a heavy handed player I find the thicker gauge more to my liking, in the past, pre Dingwall, I always used a medium gauge. With lighter gauges I feel that I have to be a bit careful! Anyway the thicker, and at first stiffer, Payson strings gave me something to go at again. I had blisters on my fingers after the first band practice, it has been quite a while since that happened. Thankfully this situation has not continued, either the strings are more supple or my fingers are toughening up :-) I think the former, as bending notes is no problem now. After a couple of weeks of playing, both me and my strings have settled in nicely together and I am glad of their full weight and growly warmth. After fitting I tighted the truss rod a little to lower the action. The heavier strings go low without buzzing. As to the main reason for tweaking my Dingwall, the fitting of the P-Tone neck pickup. It certainly does what it says on the tin. I play covers , mostly rock, blues and pop with some funky stuff thrown in. As many of the originals were played on a Precision I have tended to use the original neck pickup quite a lot, with the treble turned down to get that Precision sound. Having seen the P-Tone listed I thought that this will do the job better. Well I can confirm that it certainly does, the new pickup is fuller with an edgy mid punch. Just right for rock and blues. It has real authority without being boomy, fabulous thick punch that you can just turn up and it stays tight and clean with such a big sound. Switching to the second position, both pickups in series, it's just like pouring a warm chocolate sauce over your favourite sponge pudding. (Well to me it does :-)) The tone fills to be rich and smooth softening the edge of the P-Tone pickup and the sound gets bigger. The original Dingwall pickup was more subtle with plenty of colour in the tone, but the P-Tone in my opinion is better suited to my style of playing for rockier numbers. What you said about pickup height is so true, the height that the pickup is set has a lot of effect on the sound. It does not take more than a quarter or half turn of a pickup screw to alter the sound. I used the setup advice from Sheldon which is on the Dingwall website under Basses in the forum. But ultimately it is down to tweaking to get the sound that you prefer. Thanks once again Mark for your continued great service and advice. Always a pleasure to visit you in Warwick.